If you thought recycling was just a modern phenomenon championed by environmentalists and concerned urbanites — think again. There is mounting evidence that hundreds of thousands of years ago, our prehistoric ancestors learned to recycle the objects they used in their daily lives, say researchers gathered at an international conference in Israel. "For the first time we are revealing the extent of this phenomenon, both in terms of the amount of recycling that went on and the different methods used," said Ran Barkai, an archaeologist and one of the organizers of the four-day gathering at Tel Aviv University that ended Thursday. Just as today we recycle materials such as paper and plastic to manufacture new items, early hominids would collect discarded or broken tools made of flint and bone to create new utensils, Barkai said. The behavior "appeared at different times, in different places, with different methods according to the context and the availability of raw materials," he told The Associated Press. From caves in Spain and North Africa to sites in Italy and Israel, archaeologists have been finding such recycled tools in recent years. The conference, titled "The Origins of Recycling," gathered nearly 50 scholars from about 10 countries to compare notes and figure out what the phenomenon meant for our ancestors. 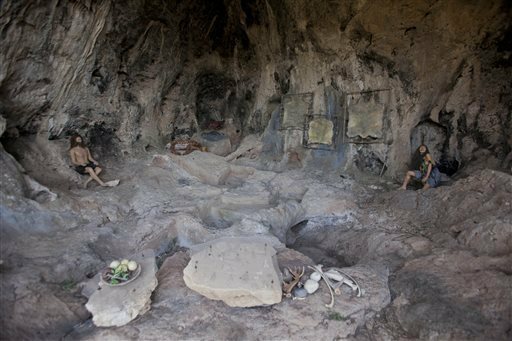 Recycling was widespread not only among early humans but among our evolutionary predecessors such as Homo erectus, Neanderthals and other species of hominids that have not yet even been named, Barkai said. Avi Gopher, a Tel Aviv University archaeologist, said the early appearance of recycling highlights its role as a basic survival strategy. While they may not have been driven by concerns over pollution and the environment, hominids shared some of our motivations, he said. "Why do we recycle plastic? To conserve energy and raw materials," Gopher said. "In the same way, if you recycled flint you didn't have to go all the way to the quarry to get more, so you conserved your energy and saved on the material." Some cases may date as far back as 1.3 million years ago, according to finds in Fuente Nueva, on the shores of a prehistoric lake in southern Spain, said Deborah Barsky, an archaeologist with the University of Tarragona. Here there was only basic reworking of flint and it was hard to tell whether this was really recycling, she said. "I think it was just something you picked up unconsciously and used to make something else," Barsky said. "Only after years and years does this become systematic." That started happening about half a million years ago or later, scholars said. For example, a dry pond in Castel di Guido, near Rome, has yielded bone tools used some 300,000 years ago by Neanderthals who hunted or scavenged elephant carcasses there, said Giovanni Boschian, a geologist from the University of Pisa. "We find several levels of reuse and recycling," he said. "The bones were shattered to extract the marrow, then the fragments were shaped into tools, abandoned, and finally reworked to be used again." At other sites, stone hand-axes and discarded flint flakes would often function as core material to create smaller tools like blades and scrapers. Sometimes hominids found a use even for the tiny flakes that flew off the stone during the knapping process. At Qesem cave, a site near Tel Aviv dating back to between 200,000 and 420,000 years ago, Gopher and Barkai uncovered flint chips that had been reshaped into small blades to cut meat — a primitive form of cutlery. Some 10 percent of the tools found at the site were recycled in some way, Gopher said. "It was not an occasional behavior; it was part of the way they did things, part of their way of life," he said. He said scientists have various ways to determine if a tool was recycled. They can find direct evidence of retouching and reuse, or they can look at the object's patina — a progressive discoloration that occurs once stone is exposed to the elements. Differences in the patina indicate that a fresh layer of material was exposed hundreds or thousands of years after the tool's first incarnation. Some participants argued that scholars should be cautious to draw parallels between this ancient behavior and the current forms of systematic recycling, driven by mass production and environmental concerns. "It is very useful to think about prehistoric recycling," said Daniel Amick, a professor of anthropology at Chicago's Loyola University. "But I think that when they recycled they did so on an 'ad hoc' basis, when the need arose." Participants in the conference plan to submit papers to be published next year in a special volume of Quaternary International, a peer-reviewed journal focusing on the study of the last 2.6 million years of Earth's history. Norm Catto, the journal's editor in chief and a geography professor at Memorial University in St John's, Canada, said that while prehistoric recycling had come up in past studies, this was the first time experts met to discuss the issue in such depth. Catto, who was not at the conference, said in an email that studying prehistoric recycling could give clues on trading links and how much time people spent at one site. Above all, he wrote, the phenomenon reflects how despite living millennia apart and in completely different environments, humans appear to display "similar responses to the challenges and opportunities presented by life over thousands of years."